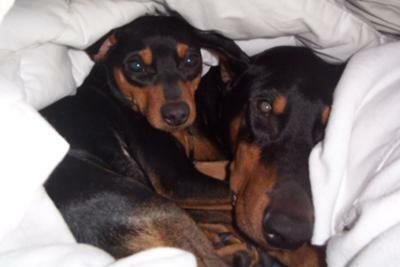 King is a 5yr old Doberman Pinscher and Prince is a 3yr old Miniature Pinscher. These two brighten any day I'm having. Both King and Prince are comical characters that always find ways of making me laugh. From wrestling (King always lets Prince win) to playing frisbee outside, these two are inseparable, both from each other and from me.